Whenever a friend visits Madison for the first time, I always take her on the requisite amble up and down the [mostly] pedestrian-only State Street. Its eight blocks offer something for every dollar-doler or window-browser, from your standard Gaps and American Apparels to smaller shops with kitschy clothes and accessories. I’m a big fan of Tellus Mater, a locally-owned store packed full of eclectic home goods – their selection of fun kitchen items always elicits at least a few outbursts of delight from me. But perhaps the most alluring aspect of State Street for locals (well, for me, at least) is its selection of eateries. Sure, you can eat at boring ol’ Taco Bell and Chipotle and all your typical chains, but more intrepid eaters appreciate State Street’s glut of more diverse eateries. From Nepalese to Japanese to Greek food, there’s a cuisine to tempt nearly any palate. I recently rounded out a State Street shopping expedition with a dinner at Kabul. It was a cold, blustery, rainy night, and S and I were more than happy to escape the wind and sit at a cozy table together. 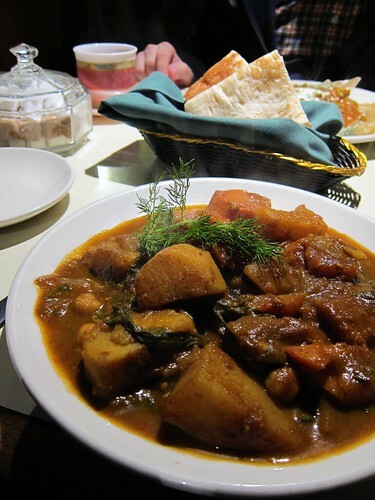 Kabul offers Afghani and Mediterranean food, with a dedicated (if small) vegetarian section of its menu. Although many of the vegetarian options feature a yogurt sauce, based on their customer service, I’m sure they’d be more than willing to customize a yogurt dish for vegans. After I asked about the veganness of my meal of choice, my server – unasked! – let me know that there’s egg in their house salad dressing, and she offered to bring me oil and a peach balsamic vinegar instead. How thoughtful! Including spinach in the title of this dish is a bit misleading, as spinach takes a back seat to the potato and carrot. Spinach dearth aside, this is an absolutely delicious meal. My plate was filled with giant chunks of perfectly cooked, fork-tender carrots and potato, with chickpea and spinach friends to round out the flavors. This wasn’t quite a stew, but there was just enough liquid for bread-dipping. The flavor was terrific – spicy, but not overpoweringly so, with an aromatic blend of spices I couldn’t quite identify. Dill was definitely one (I cheated with that, though, because the dish was garnished with a large fresh dill sprig), and I think there were some sweeter spices like cloves. Whatever they were, they made for a complexly flavored, warm dish, perfect for a cold, rainy evening. S ordered the Vegetarian Ashak, described as scallion-filled steamed dumplings, topped with green beans and yogurt sauce, sprinkled with mint. He enjoyed them, although he thought the dish was a little heavy on the yogurt sauce. We both rounded out our meal with many cups of delicious, hot tea. It was a fantastic meal, perfect for a blustery night! What’s your favorite style of food? Do you have very diverse restaurants where you live? The stew looks great! That’s exactly the sort of stuff I love to eat; warm, filling, spicy and hearty but not laden with oils and fats or depending on starchy carbs.